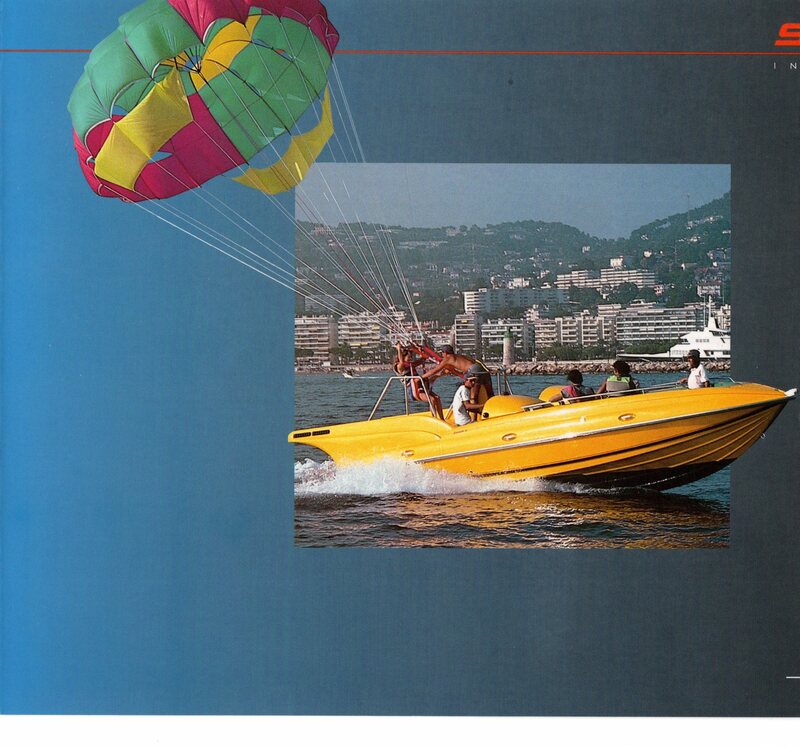 The biggest innovation in the parasail industry has been the advent of the commercial parasail winch boat, invented by Mark McCulloh in the mid 70's. 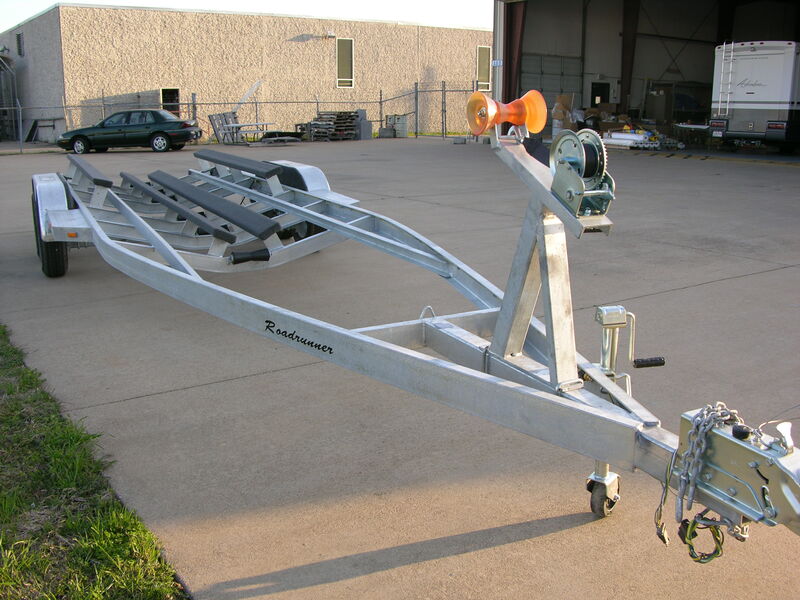 Basically, the parasail winchboat hydraulically launches and retrieves flyers directly onto a built-in flight deck. Commercial parasail operators can now run a professional business at resorts in a controlled, state-of-the-art fashion without regard to shoreline conditions, unfavorable wind directions or costly ground crews. 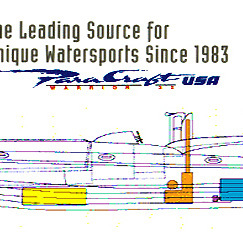 The Paracraft USA Warrior 32’ we manufacture today is a much upgraded descendant of the original Paracraft designed in the late 80’s by Brian Gaskin of England. 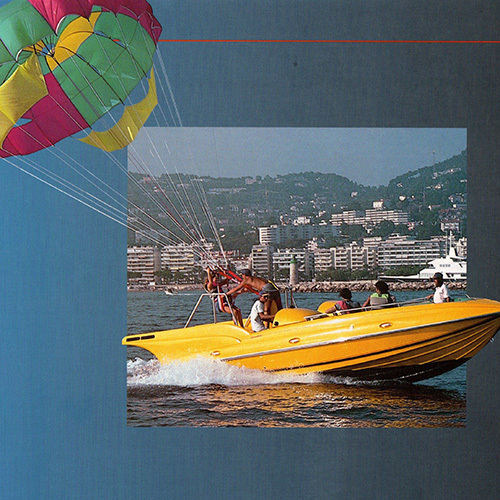 Brian is recognized worldwide as the “Father of parasailing”, having invented the modern 16 panel design used by virtually every chute manufacturer today. Since Paracraft's introduction, entrepreneurs have found that Paracraft leads the way as the most innovative and efficient. Its ease of operation and simplicity make it the most attractive option available today. The Paracraft Warrior remains the only 100% hand-laid fiberglass boat that is designed from the ground floor up specifically for commercial parasailing. It has a professional, futuristic look incorporating a unique, one-piece, molded-in flight deck. The deck has been appropriately angled up at the back to provide stability when swapping the flyers. 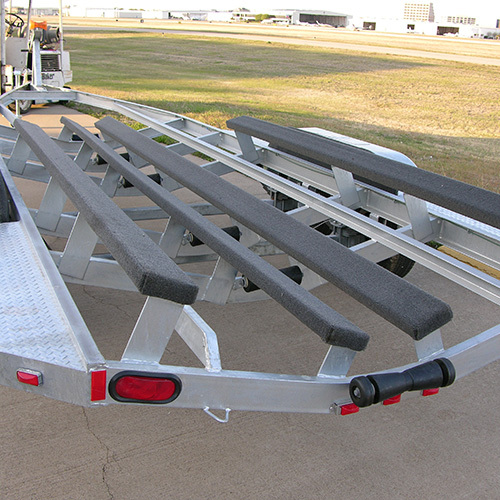 This angle creates a level surface for chute inflation and deflation while underway and provides increased freeboard. This greatly reduces the chance of damaging the chute by catching water during deployment and recovery. This non-slip, self-draining flight deck is large: 9 1/2' by 14'. This allows ample room for ease of movement by flyers and crew. 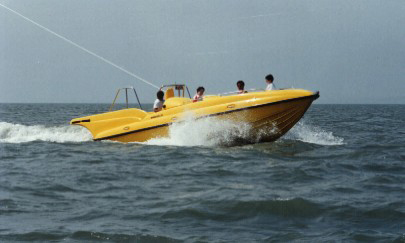 The one-piece "uni-body" construction technique used in building the Paracraft Warrior is found in high-tech off-shore racing boats, but is innovative in the winchboat industry. This one-piece upper deck ensures the strongest, longest lasting deck with trouble-free performance and ease of cleaning. The handrails on the deck are stainless steel as are the cleats which have been recessed to eliminate snags and damage to the chute. The lifting strakes and chine’s on our hulls have a negative angle so planing is quick and easy. 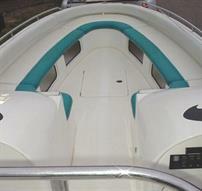 On the Warrior you will find that trim tabs are unnecessary. This means less bow rise and more fuel economy. 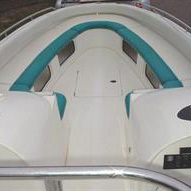 The exclusive Paracraft pulpit for hand inflating the chute is unique to the industry. 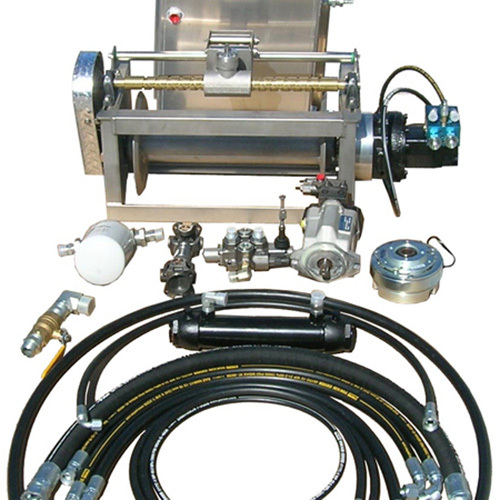 This eliminates the costly, clumsy and troublesome inflation mast or other “assist units”. Hand inflation is sensible and easy for predictable, professional inflation. Additionally, undue wear on the chute lines by inflation masts is eliminated, and the chance of dragging the chute in the water and damaging it is greatly reduced. Of course if a commercial operator prefers a different inflation system the Paracraft can easily be modified to suit their specific needs. 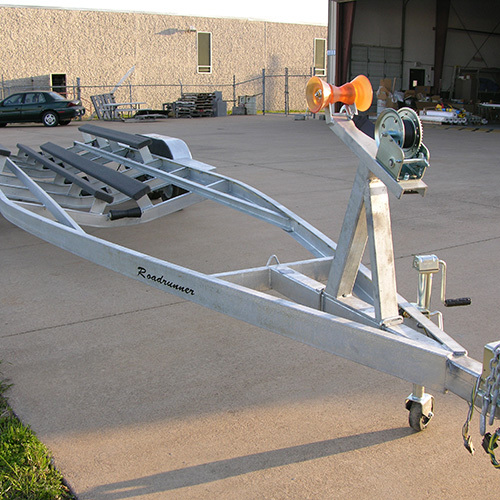 Our winch post is outfitted with a multi-roller assembly. This allows less wear and tear on the tow rope and the chute's yoke, no matter where the chute tracks behind the boat. Whether you choose gas or diesel, the Warrior is fitted with a variable speed, on-demand winch utilizing no worrisome electromagnetic clutch. This means you do not have to speed up the engine to make the winch work. It can pay in or out from a few inches to a few feet per second with as little as 1200 RPM. This saves fuel and makes the chutes fly better, especially in maximum winds. 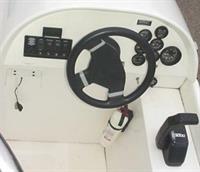 Dual winch controls for operation by the captain or deckhand are also available. Routine mechanical servicing is a cinch with our over-sized engine compartments that allow freedom of movement virtually 360 degrees around the engine. 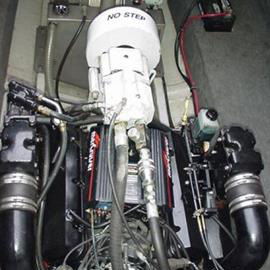 Paracraft's engine compartments are sealed to block salt water and other elements from entering the engine and winch. All components stay cleaner and are more protected from corrosion. The compartments are finished out and have almost enough headroom to stand up in. If you are looking for the best winch boat in the industry with the driest and smoothest ride even in the roughest seas, look no further than the Warrior. The deep "V" hull entry on the Warrior begins with a 43 degree dead rise and tapers down to 24 degrees at the transom. The beam is 9 1/2'. Add seating in the flared bow for 12 adults and storage for 12 more and you will find the most comfort anywhere with practicality as the primary concern. Although utilitarian, you can't miss the sleek lines of any "Paracraft" which distinguish it in the marketplace as the only boat with the 21st century look. If you consider looks, styling, serviceability and utility with every detail of operation meticulously thought out, "Paracraft" offers it all. Each Paracraft Warrior is proudly manufactured in the USA. With advanced design and robust construction our hydraulic winch offers reliability and durability combined with a large drum capacity (to 1000'). It incorporates a heat exchanger with sea water cooling built into the oil reservoir. A fresh water cooling system can also be added if the customer desires. Our exclusive self-aligning drum ensures dependable re-laying of rope on the drum without the necessity of a rope guide which is often a trouble source for maintenance and failure. This self-aligning feature operates reliably even when winching in parasails not directly behind the boat. However if the customer prefers a line guide system, this can easily be offered as an additional option. The system is directly driven by a pulley and belt attached to the crankshaft on both gas and diesel engines. When the winch is not in operation, a small amount of pressure is always circulating through the hydraulics in a “standby” mode. This allows a minimum continuous oil flow for power on demand. This uses less power and fuel in a “standby” mode and eliminates the need for the problematic and troublesome electromagnetic clutch. The system allows minimum and maximum winch speed for reel in and reel out at 1200 RPM and above, without the need to speed up the engine. This means fuel savings and better chute performance since winch speed and engine speed are not “mated”. Our winch utilizes a variable speed control “joystick” with a built-in system which stops automatically if the operators hand is removed from the control. 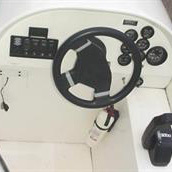 This winch lever is strategically located so it can be operated by the boat captain or by the crew member, thus allowing the captain to concentrate on the driving. Or, if the customer prefers only one control for the captain can be offered. 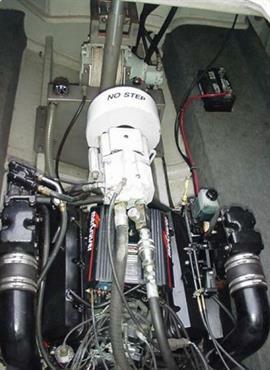 An automatic winch brake system is fitted to prevent “freewheeling”. 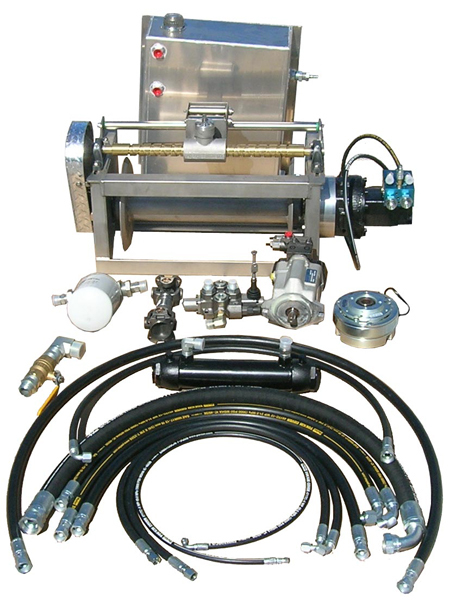 Also, an automatic pressure release valve prevents an overload of the system. 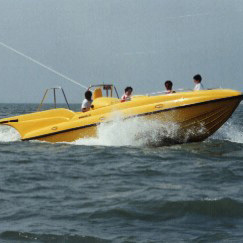 Over water line: 6' 3"
Choice of gas or diesel with traditional outdrive. Direct or “V” drive options also available. Your choice of hull and interior colors, choice of engine type, power takeoff (PTO), hydraulic winch system, full stainless steel rails and cleats, nonskid fiberglass surface, deluxe upholstery, large rub rail, full instrumentation, engine room blowers, automatic bilge pump, navigation lights, fire extinguisher, battery, 600 ft spool of special Flightline towline. 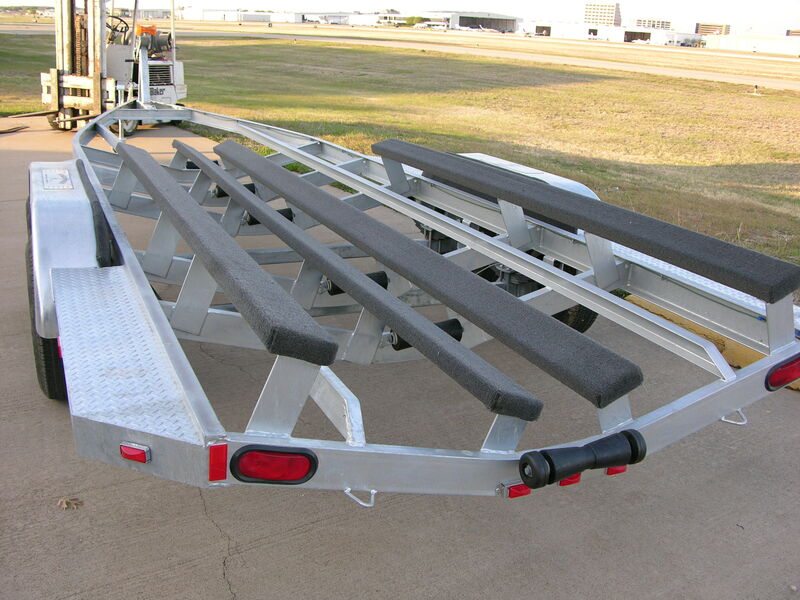 Galvanized trailer available upon request for an additional charge. Note: We reserve the right to change any specification at any time without prior notice.